Koi herpesvirus (KHV) is a fatal disease of carp which has spread rapidly between UK recreational fisheries. Although live fish movements are the main risk for disease spread, we’ve demonstrated that KHV can be transferred by contaminated angling equipment. Although we suspected that this is a disease transfer route, there was little direct proof. So we designed a series of simple experiments to get more data, and thought you’d like to see what goes on behind the scenes at Cefas. An example of a net used by anglers to hold carp. To investigate the chance of an angler catching a fish shedding KHV, we examined the feeding of KHV infected fish. If a fish is feeding it can be caught by an angler. Therefore we infected common carp with KHV, via a bath challenge, and fed them 40 food pellets each day. The feeding rate was monitored by counting uneaten pellets. Carp were netted from their tank each day and then returned to check the levels of virus in the mucus on the net. all of the carp exposed to KHV became infected; 75% developed clinical disease. The remaining 25% survived the infection by creating antibodies. 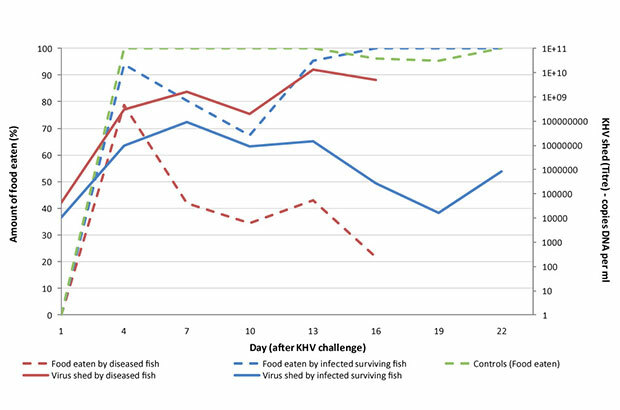 KHV infection did reduce feeding, but they still ate over 40% of the daily food ration whilst shedding virus. This was an in vitro study to assess if KHV can survive on nets, and how storing nets differently would affect the chance of transmission. The dark samples were kept in an opaque box, whilst light samples were exposed to sunlight. Damp nets were sealed in their plastic bag, whilst bags for the dry samples were split open. The nets were incubated for 18 hours before the mucus was removed, centrifuged and filtered before it was used to inoculate common carp cell cultures. The cell cultures were then checked to see if KHV had an effect on their structure. Next we wanted to check if anglers’ nets transmit the disease. So we held KHV diseased carp in a fine mesh keep-net overnight at 23°C. These infected carp were then removed, the net stored for 24 hours in a sealed plastic bag, and then we introduced carp without the disease to the net. 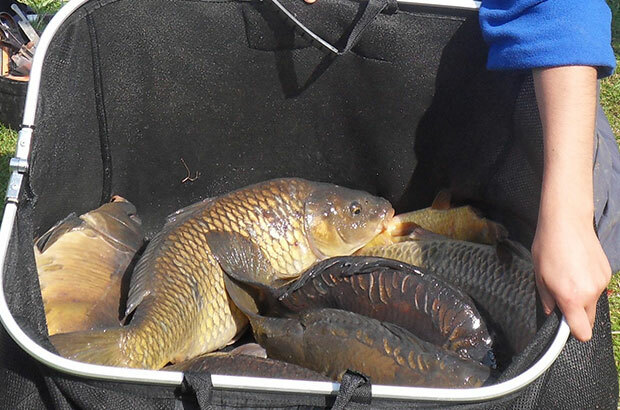 We found that these carp displayed clinical signs of KHV disease within 14 days of transfer to the contaminated net. Hopefully you can see these experiments show that fish shedding KHV virus feed and are therefore likely to be caught by anglers, they can contaminate nets, the virus can survive on these nets, and that KHV can be transmitted to uninfected fish by contact with infected nets. Put simply, the use of infected nets is a disease risk to fisheries. 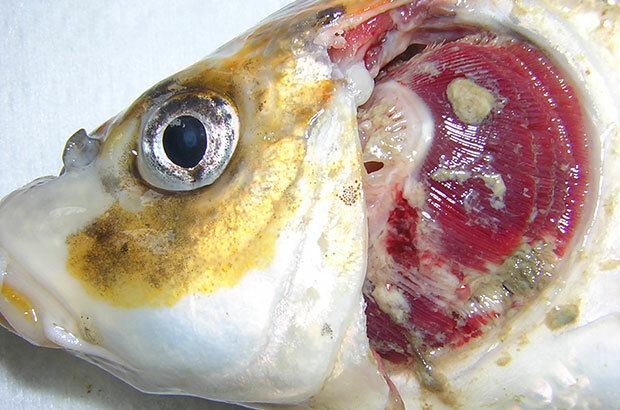 Moving fish remains the biggest risk for KHV transmission. But we reviewed popular angling literature and found that 52% of UK fisheries allow the use of keep and landing nets. Anglers’ nets may therefore have helped spread KHV within the UK. So a high proportion of carp fisheries are potentially at risk of getting the disease via nets. To reduce the risk, we always tell anglers to dry and expose their nets to sunlight before leaving a fishery, or going to another one. For updates please sign up to email alerts from this blog, or you can follow us on Twitter @CefasGovUK. All fisheries, whether private or day ticket, should supply all nets. This reduces the chance of the virus to spread by a hundred per cent. Was there any test that 'net dips' of biocides/disinfectants at fisheries effectively kill KHV cells, and what would be the ideal duration for treating a net? Yes, KHV can be killed by disinfectants (see the disinfectant listing scheme for approved ones) but they must be maintained according to manufacturer’s recommendations and immersed as instructed. Where do you find the disinfectant list and how do I have one of my disinfectants added? The aquaculture disinfectant list is on GOV.UK (https://www.gov.uk/guidance/aquaculture-disinfectant-listing-scheme-apply-or-view). The guidance also explains how to apply to add a disinfectant. I had KHV at my fishery years ago, brought in by stocking with Israeli F2 carp, which killed most of my native stock. How long does a net need to be exposed to sunlight to destroy the virus? In this experiment we left the net for 18 hours. We'd recommend thoroughly drying the net in direct sunlight for as long as possible - until it is completely dry. However we'd always advise to use dips as well. Any fishery which is proved to have KHV should be closed until clear. I have a fishery and there is a local water infected. I have always made anglers dry their nets on the bank prior to fishing and exposure to UV rays. I have now added a net dip, Virkon S and ask anglers to still spread their nets to dry. I understand that it could also be possible for herons, cormorants and otters to transmit to disease if they have come into direct contact with a contaminated fish through trying to eat them. Is that correct? We have not done any studies to see if predators transmit KHV disease. However our Fish Health Inspectors, who check these disease outbreaks, have said that although you couldn't rule out the possibility, it is unlikely as many predators consume the fish on site. Has the increase in cormorants affected this? Have the birds ever been checked if they carry it? We've not done any studies on cormorants and if they carry the disease. So we don't have any answer to this. Have you done any studies on F1 Carp and their susceptibility to the disease? Work is ongoing on this. However F1 carp hybrids are listed as susceptible to KHV disease in the OIE manual. This manual is used worldwide to provide a standardised approach to diseases. The modern, fine mesh, "carp friendly" keepnets marketed by the angling trade are also part of the problem for fisheries trying to protect themselves from infection. They hold an enormous volume of mucus, faeces and scales that is nigh on impossible to remove when using a net dip. It's a bit like trying to wash stockings without turning them inside out! Perhaps it's time to return to nets with larger voids so that they can be effectively cleaned when using a net dip. It is stated that live fish transfers are still the main route. Are there any figures as to how many UK outbreaks, in percentage terms, have closely followed admitted/known fish introductions? Is it right to presume that the majority of such links will only relate to 'legal' introductions? Given Britain's climate, do we as anglers need to be putting our nets/mats under UV lamps during the less sunny months of the year. With regard to the spread of fish diseases, live fish movements are generally considered to be the main route of transfer based on our experience of the control of disease outbreaks. However the position is complicated in respect of KHV disease as clinical expression only occurs at water temperatures between a range of around 15°C-25°C. Fish may carry koi herpesvirus below this temperature range but not exhibit any signs of disease. As ambient water temperatures in the UK are below 15°C for most of the year then the period of time when infected fish could be introduced into waters before any disease is evident can be protracted. We do not have figures for KHV disease outbreaks on fisheries associated with recent fish introductions. The introduction of fish into a fishery without a permit to do so would be an illegal act and so is unlikely that an individual would admit to such an action. Our experience is that, certainly when KHV disease first emerged as a serious problem on fisheries, we saw a lot of koi in samples for fish taken for diagnostic tests. Most of the fishery managers had not introduced koi and were not aware of where they had come from. Therefore we assumed that these fish were unwanted pets and were illegally introduced into waters by members of the public. We see less of this now not least due to publicity campaigns by the Ornamental Aquatic Trade association (OATA) on the disposal of unwanted pet aquatic animals. However we believe that illegal introductions of fish into fisheries continue to play a role in the spread of KHV disease. Good biosecurity practices by anglers can significantly reduce the spread of a variety of fish diseases. We therefore recommend the use of approved disinfectants, the cleaning and drying of equipment, in particular keep nets, unhooking mats, and ‘stink bags’, and exposure to sunlight. The highest risk period for KHV disease is during the summer months when clinically infected fish are known to shed virus. Outside of this period, disinfecting, cleaning and drying equipment should be sufficient to reduce the risk of spreading KHV disease. Let's assume that all Carp carry KHV which is activated by stress - such as high water temperatures, change of environment (transfer, low oxygen, water treatment chemicals etc.) and angling pressures. Then the test you performed by putting the test carp under extreme stress may have activate the virus? The testing undertaken is on fish that have clinical signs of KHV at the time of sample. However, KHV is often triggered by a stress response in fisheries. Is it the same for drying nets in the winter, when there is no sun and UV levels must be lower? Whenever it is light there is UV light. Drying and UV exposure times will be increased but will be effective. Oddly, while many fisheries insist on anglers dipping their nets on the way into fisheries, I have never seen a fishery suggesting that anglers should also dip their nets on the way out again. Given the large number of infected sites that have already been identified and by inference, the number of sites which harbour the virus as yet undetected, such a policy could have a significant influence on the number of new infections being introduced by angler's nets. Surely its about time anglers took some responsibility and help protect the fisheries that we choose to fish, it does not take a great deal of effort to dry your nets?